Bollywood is flooded by entry of star kids such as Sara Ali Khan, Janhvi Kapoor, Ananya Pandey among many others. And one name that is most likely to join this list sooner than later is Shanaya Kapoor. 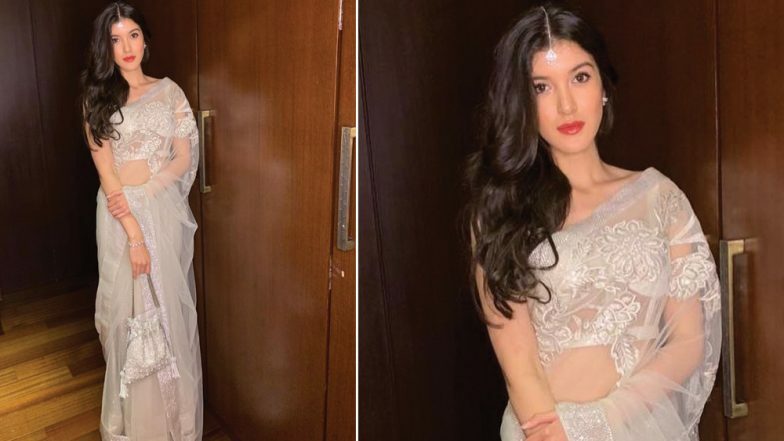 Her mother and popular jewellery designer, Maheep recently shared a picture of her pretty 19-year-old daughter in an embellished Abu Jani Sandeep Khosla saree. 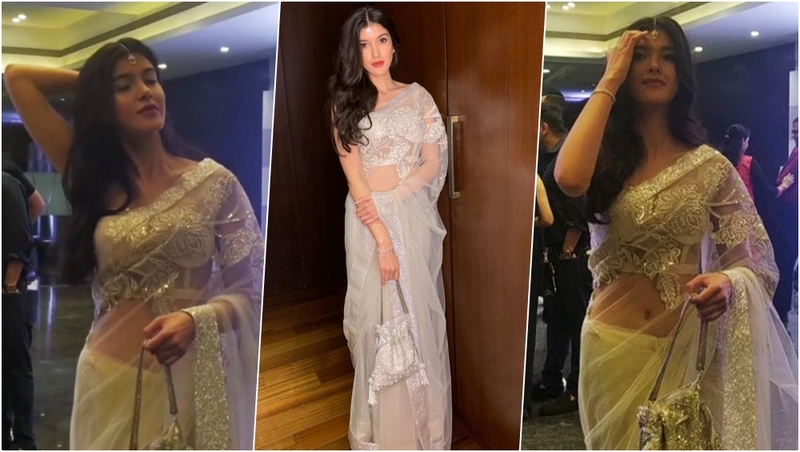 We must say Bollywood actor Sanjay Kapoor’s daughter cuts a pretty figure in this designer saree. Shweta Bachchan Nanda Walks for Abu Jani and Sandeep Khosla, Video of Proud Father Amitabh Bachchan Capturing Her Catwalk on Mobile Phone Goes Viral. Shanaya had recently attended a fashion show by designer duo Abu Jani and Sandeep Khosla by the Cancer Patients Aids Association (CPAA) to raise funds for cancer survivors. The stylish teenager was cheering for her cousin and actress, Sonam Kapoor who was the showstopper for the designer. While the 33-year-old Neerja actress set the ramp on fire with her grace and elegance, her little cousin stole the limelight off the stage. Draped in a white sheer saree with applique work, Shanaya is carrying off the six yards of awesomeness with much elegance. The girl takes her desi style to another level by wearing matching jewellery, maang tikka and earrings from Anmol and dainty bracelet from Mahesh Notandass FineJewellery. Shanaya is also carrying a pretty silver potli from The Pink Potli to complete her look for the event. Speaking of Shanaya’s cousin and showstopper, Sonam in a statement said: "It is an honour and a privilege to be a part of this show. I am a huge believer in using my voice to support social and health issues. The CPAA does outstanding work in the field of providing holistic care to those affected by Cancer." As for Shanaya and her goals of entering Bollywood, she has taken up the role of assistant director for an upcoming project. However, her father has not completely ruled out prospects of Shanaya as a lead actress. Sanjay had said, "Honestly, I really don't know when that will happen. She has just finished her 12th standard and she's working towards it. But she hasn't signed anything till now; she's too young. Hopefully, soon enough." We will have to wait and watch for that.